Isn't she just the cutest on her new yellow bike??? She decided that she is more of a "biker" girl than a "scooter" girl! Ok, I haven't actually tried this wine, but I have seen it at most places I buy wine. I am just saying this, "Parents, beware!" What if your child thinks this is "juice" box? What if you accidentally put this in their lunchbox, and omg, they take it to school??? I used Pillsbury Strawberry cake mix - baked it in a sheet pan. I added sprinkles to it. Once it was cooked, I mixed it with Strawberry frosting. 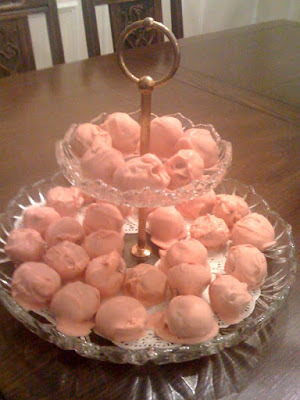 After they chilled overnight, I melted pink vanilla flavored wafers and dipped. They look awesome. Let's see if they are at hit at the Easter gathering I'm headed to.